Thai Tibetan Aroma Oil Massage is a unique combination of Traditional Thai Massage and Swedish Massage techniques, with a strong influence from Tibet and India. The method that we offer is the Northern method, from the ITM (International Training Massage) school in Chiang Mai, Thailand. It is part of their Spa Mantra Division. Traditionally this massage is done using Coconut oil infused with Jasmine Essential oil, Coconut Palms and Jasmine flowers grow in abundance in Thailand year round. 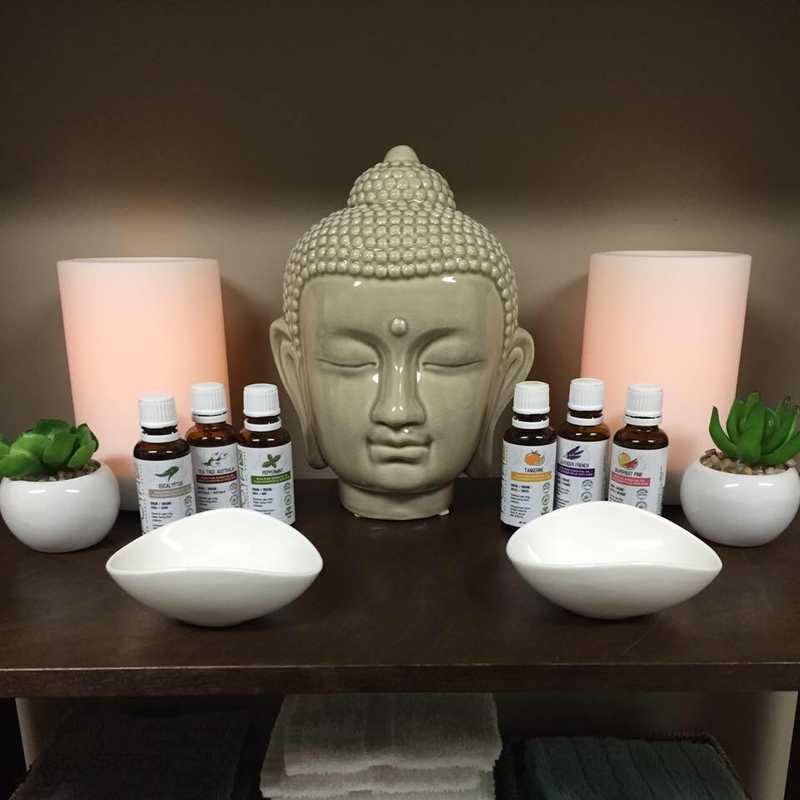 We also offer a variety of other Essential oils for you to choose from if you prefer, including Tangerine, Neroli, Vanilla, Eucalyptus, Lavender, Grapefruit, and Peppermint. If you have a sensitivity, or just prefer to use an unscented massage oil, we have Pure Coconut oil, Grapeseed oil and Apricot Kernel Oil as an option. The Thai Tibetan Aroma Oil Massage is a full body treatment with specific sequences for each area of the body, the back and neck, posterior and anterior legs and feet, arms and hands, and anterior shoulders, neck and face. The result is incredibly relaxing but can also be very therapeutic and stimulating for the many systems of the body. Thai Massage is considered to be one of the worlds most ancient healing modalities. It originates from over 2500 years ago and has roots in India and Ayurvedic medicine. In the earlier years, it was preformed by Buddhist Monks in their temples as one of the elements of indigenous Thai medicine. In modern day, it is often referred to as Thai Yoga Massage, as it combines passive Yoga-like stretching, with reflexology and acupressure in rhythmical, fluid movements. The Northern Method of Thai Massage is referred to as Nuad Bo Rarn - "Nuad" meaning massage, and "Rarn" meaning something that is ancient, sacred and revered. Traditional Thai Massage is performed on a mat on the floor while fully clothed with no oil. For the Thai Tibetan Aroma Oil Massage, the elements of Traditional Thai Massage are performed overtop of the sheet, while the sequences using oil are practiced using the same draping techniques as with our Therapeutic and Relaxation Massage treatments. This essential oil is extracted from the jasmine flower. It is often considered beneficial as an anti-depressant, anti-septic, emmenagogue and cicatrisant, as well as a skin conditioner. It has a slightly sweet and soft, pleasing aroma. stimulate the release of certain hormones such as Seratonin, which helps boost energy levels. relief from symptoms of cough and colds. 4. Cicatrisant: It has been noted to possibly be effective in reducing the appearance of scars or stretch marks. ​skin is cracked or on an open wound. It is often used to aid in treatment of eczema or dermatitits. Precautions with Jasmine Oil: Like many essential oils, there is a risk of skin irritation or allergic reaction. Jasmine should not be used on cracked skin or open wounds.